2009 Flu Pandemic Was 10 Times More Deadly Than Previously Thought : Shots - Health News A fresh analysis finds that the death toll from the H1N1 swine flu in 2009-10 was severely underestimated. The Americas were hit much harder than Europe or Australia. And the deaths occurred in a much younger population than normally affected by the flu. By the World Health Organization's official tally, the flu pandemic of 2009-10 killed 18,449 people around the world. Those are deaths of people who had laboratory-confirmed cases of the so-called swine flu. But a fresh analysis says the real toll was 10 times higher — up to 203,000 deaths. And maybe it was twice that, if you count people who died of things like heart attacks precipitated by the flu. Let's take the conservative figure of 203,000. That's about the same as a normal flu season. So the figure confirms the popular impression that the H1N1 flu pandemic of 2009 was a paper tiger, as these things go. Or as one NPR listener suggested back in early 2010, the headline might be: "Despite Puffed-Up Fears, Swine Flu Was A Complete And Total Bust." That's an odd complaint, of course — as though it would have been better if the 2009 pandemic had been more like the pandemic of 1918-19, which killed an estimated 50 million people around the world. But the current study, commissioned by the WHO, helps explain why the agency struggled so much to calibrate its response to that pandemic and find the right tone for its public messaging. WHO leaders were first criticized for taking too long to declare a pandemic when spread of the disease clearly met its definition. Then critics charged the agency with hyping the situation under pressure from vaccine makers who wanted to recoup their investment. The low number of laboratory-confirmed deaths — just 18,449 — added to the confusion, a team of global health researchers write Tuesday in the journal PLOS Medicine: "This modest number has caused many to wonder what all the excitement was about, and some to question whether the pandemic response was excessive." "There were all kinds of conspiracy theories in Europe," says the study's lead author Lone Simonsen of George Washington University. "But I can't see how they could have responded in any other way." The most important insight from the analysis, Simonsen says, is that the H1N1 swine flu was hugely variable in how it affected different parts of the world. "The take-home message is that you can have such heterogeneity in a pandemic," she tells Shots. "It was really, truly twentyfold worse in some countries than in others." In particular, the Americas were much harder hit than Europe or Australia and New Zealand. That posed a political dilemma for theWHO– a creature of its 194 member nations – as it tried to organize a coherent global response. But even in the same region, there were inexplicable variations in severity. "In Argentina it was very severe, and right next door Chile was affected far less," says Simonsen. Why did the flu have such differential impact? "That's the million-dollar question," she says. Her favorite hypothesis is one that seems surprising in light of traditional thinking about how people's immune systems react to the virus. The usual notion is that people who have previously been infected with flu viruses are at least partially protected when a new, but similar, strain comes along. It's almost as though the earlier infection acts like a vaccine. That's almost certainly true, and probably explains why people over age 50 were strikingly underrepresented among the deaths from the 2009 H1N1 strain. 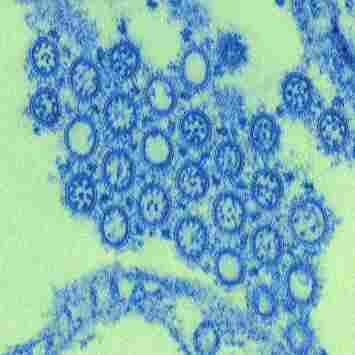 Older people were exposed to the descendants of the fearsome 1918 virus, which were closely related. But scientists are beginning to think that something like the opposite can also occur. That is, when a population has been exposed to an H1N1 seasonal strain that's distantly related to a new, pandemic virus, their previous exposure can set the stage for a more severe reaction. Recent animal experiments support this idea. In fact the H1N1 strain circulating in the season before the recent pandemic was such a distant cousin. Under this hypothesis, younger people — who didn't have the benefit of residual protection from the more closely related 1918 virus circulating in the early decades of the last century — may have been primed for a more severe response to the pandemic H1N1 strain by their exposure to the more distantly related seasonal H1N1 virus. But Europeans were also exposed to the distantly related H1N1, and they didn't suffer as many flu deaths in 2009. So that's not an entirely satisfactory explanation. "We still don't understand these global variations – why Americans were hit harder than Europeans," says Dr. Michael Osterholm, an infectious disease specialist at the University of Minnesota. "It couldn't be that one region had better care." Misunderstandings about regional differences in flu severity help explain why many people underestimated the recent pandemic's real impact, Osterholm says. "I think some people rushed to judgment in 2009," he tells Shots. "They looked at countries with less impact and said, 'Aha, this is what's happening.' "
Another message that comes through clearly in the current study is the unusual burden that fell on previously healthy children, teenagers and young adults, especially pregnant women. "The thing that sets this pandemic apart is not the absolute number of deaths, but the fact that those deaths occurred in a much younger group of people than one normally sees during a typical flu season," Dr. Anthony Mounts of the WHO's Global Influenza Program writes in an email to Shots. "Therefore, if one thinks in terms of years-of-life-lost, the 2009 pandemic had a much greater impact than a typical influenza season."